Different drawing tools suit different styles. Here we explain how to choose the best materials for your toolkit. 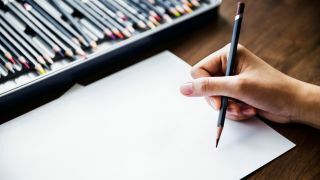 When you're starting a new illustration – whether doing quick sketches or highly realistic pencil drawings, you want to have the right drawing tools at the ready. But picking the best pencils for your needs can feel like a process of trial and error. When first becoming acquainted with using pencils for artwork, we'd recommend buying one of each grade from 9H to 9B, so you can get familiar with the hard/light and soft/dark qualities of each. Experiment with various surfaces, and try a wide variety of strokes and mark-making. For inspiration, take a look at our guide to different pencil drawing techniques. In this article, we'll run through some different drawing tool options you can try out, plus the accessories you'll need to get started. If you're just starting out, you'll no doubt want to stick with the familiar. Graphite pencils are the most common type of drawing tool as their composition allows for the smoothest strokes. Once you grow in confidence, though, it's time to start widening your scope. For instance, you could try solid graphite pencils. These are solid sticks of graphite and clay composite (as found in a graphite pencil), which have no casing other than a wrapper or label. Often called woodless pencils, they're used primarily for art purposes, as the lack of casing allows for covering larger spaces more easily, creating different effects. Charcoal pencils, as the name suggests, are made of charcoal and provide fuller blacks than graphite pencils, but tend to smudge easily and are more abrasive than graphite. Sepia-toned and white pencils are also available for duotone techniques. "I use charcoal because it's a versatile drawing tool that produces a variety of effects, from thin lines to bold strokes," says Jean-Sébastien Rossbach, an award-winning illustrator, concept artist and painter. However, he adds a word of warning: as with blending tools, "those just starting out can find it tricky to control, with the results often looking messy." Of course, drawing isn't just about pencils: ink drawing is another popular medium that can lead to some beautiful results. Traditional pen and ink consists of black ink and white paper, creating space through thick or thin lines, repeating marks for texture. There are many options for working in ink so, just as with graphite, you'll need to find which best suits you by experimenting. If you want your drawing to feature vibrant colours then you'll probably want to investigate pastels. Pastels are a great medium for producing colourful artwork easily, with no need for water, brushes or palettes. The main types of pastels are soft and hard pastels, oil pastels, pastel pencils and water soluble pastels. Read our guide: How to start pastel drawing for more on key tools and techniques. And that's not all! You can also try using carbon pencils, which produce a fuller black than graphite pencils, but are smoother than charcoal. There are grease pencils, which write on almost any surface including glass, plastic, metal and photographs. Plus there are watercolour pencils, designed for use with watercolour techniques (they can also be used by themselves for sharp, bold lines). In short, there's a world of different drawing implements out there. So start trying different drawing tools, and don't hold back. After gaining an understanding of the abilities and limitations of each pencil, you can then investigate further with blending tools and erasers for different effects. A blending tool can be anything you can use to add texture to your graphite marks. The most obvious tool you have already to hand: your fingers! Other blending tools you can potentially use include tortillions, blending stumps, paper, cloth, cotton wool, make-up wipes, chamois, paper towels, paper tissue, paintbrushes, and probably a dozen other things we haven't thought of. Blending stumps are made from tightly wound paper, formed into a stick and sanded at both ends to create points. Used ideally to create gradations and half-tones, the sanded area is ideal for blending while the point (ideally kept clean) is best used to blend light-toned areas. Unlike fingers, blending stumps leave no oily smears. Blending tortillons are made from rolled, loose-fibre paper and are pointed at one end. The softer paper texture of blending tortillons gives a different blending texture to stumps, and they can be used to push colour and soften pencil edges. Be warned, though: attempting the use of blending tools too early can look smudgy and amateurish, so don't rush into this. You also need to keep your pencils sharp. And while a pencil sharpener is fine when you're just using a pencil to write with, for drawing we'd suggest you're better off using a scalpel or craft knife. Unlike standard office erasers, kneaded erasers (or putty rubbers) are dry and don’t smudge or leave flaked residue. Their softness makes them ideal on sketching paper with a lot of ‘tooth’. These erasers can also be formed into points for picking out highlights in eyes and hair.